Sadiya Khan, MD’09, GME’12, was acknowledged by the American Heart Association and the American College of Cardiology for outstanding performance in her training. Sadiya Khan, MD’09, GME’12, a second-year Cardiology fellow, received awards for both her academic and her clinical performance. 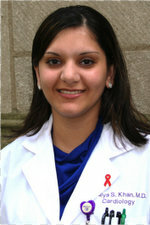 She was honored with the American College of Cardiology Henry I. Russek Travel Awards for Fellows in Training and the American Heart Association Women in Cardiology Trainee Awards for Excellence. The Russek travel awards recognize eight fellows for academic performance in cardiovascular medicine. The award is named in honor of Dr. Henry I. Russek, who served as director of the New York Cardiovascular Symposium for 25 years, and supports travel to the event. The women in cardiology trainee awards acknowledge 25 female cardiology fellows who exemplify a balance between clinical expertise and scientific interests. Khan received the award during the recent AHA Scientific Sessions. This summer, Khan will begin research on the role of the protein PAI-1 in hypertension, metabolic syndrome, and cardiovascular disease. She will be working in the lab of Douglas Vaughan, MD, chair of Medicine.